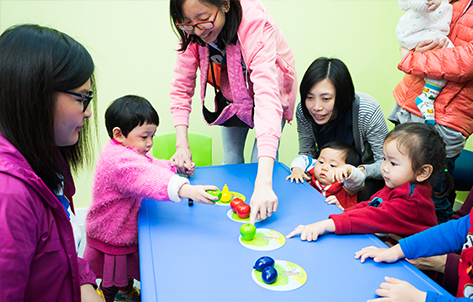 The design of training curriculum is based on children developmental milestones. To prevent and early-identify children speech and language problems (Language understanding, expressive language ability, speech fluency, voice and hearing problems). To enhance children social and communication skills by interactive role-plays. Logical reasoning and creative thinking skills which fit the needs of daily routines will be introduced by our experienced social workers. 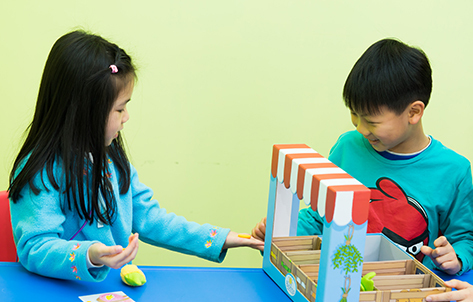 To strengthen children concentration and eye-hand coordination skills. Training will focus on developing appropriate hand-writing skills and the ability to memorize the strokes of Chinese characters. To improve children ability to use appropriate body languages, facial expressions and voice in presentation. Different musical instruments will be used to enhance children communication intention and self-esteem. To strengthen children ability to recognize recurrent patterns in sentences and put sentences in a logical order to make a paragraph or passage. Reading strategies will be consolidate at the same time.